The small country church of St John's, Duxford is set beside the village green and exudes a sense of timelessness and history. The church is very simple, composed of only a nave, chancel, chapel, south porch, and an embattled tower oddly placed between the nave and chancel. 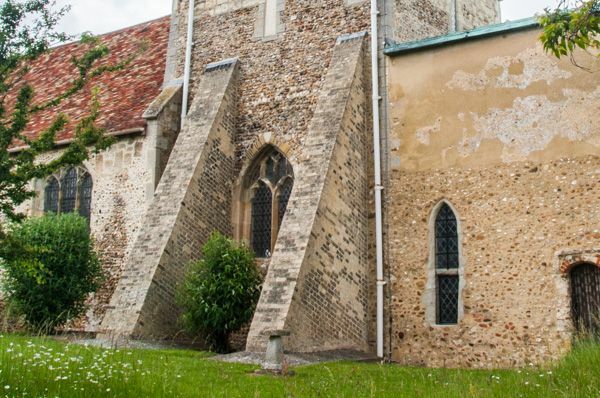 The core of the church dates to the early 12th century, with additions throughout the medieval period, including the north chapel, added in 1340, and the 15th-century north aisle. The church is accessed through the attractive 15th century timber-framed south porch. 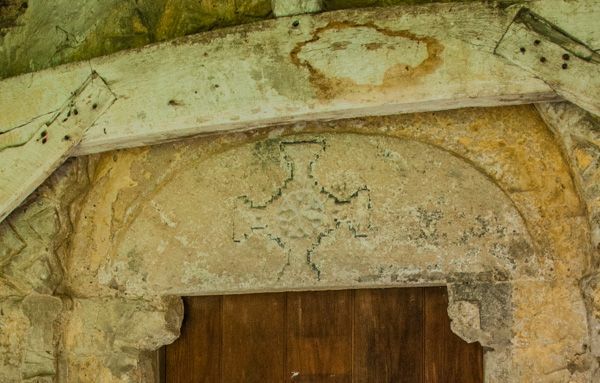 Enter the porch and you will find the oldest feature of St John's, above the simple Norman door, where the tympanum is carved with the symbol of a cross. The cross is likely Saxon and may date to as early as the 7th or 8th century. The most striking architectural feature of St Peter's is the huge Norman crossing, with massive arches supporting the central tower. 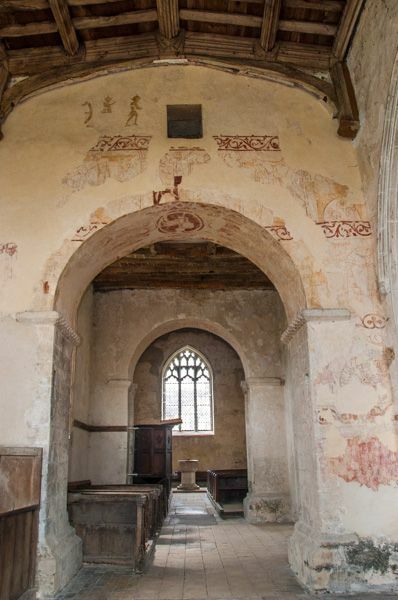 As impressive as the crossing is, the real treasure of this lovely church is its wealth of medieval wall paintings. 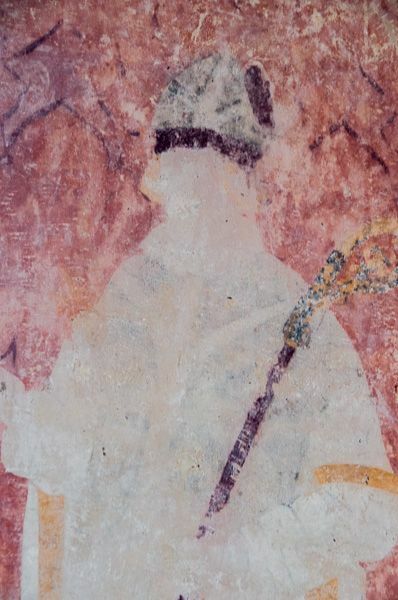 The best-preserved paintings are on the west wall of the chancel, where you will find a variety of Biblical scenes including the gruesome martyrdom of St Margaret, the Crucifixion, and a collection of grotesque beasts and demons. There are a variety of other scenes from the lives of the saints, an Agnus Dei, church officials, and traditional foliage decoration. 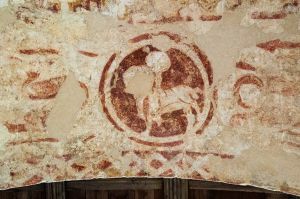 Taken as a whole, the wall paintings are a wonderful medieval art treasure. 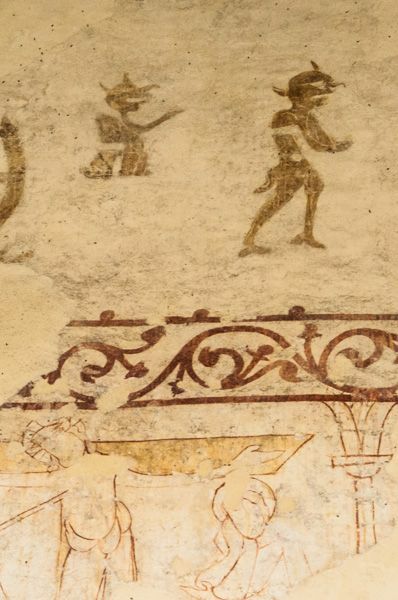 Perhaps less fascinating is the graffiti which is scratched all over the church. This is not the work of modern vandals - far from it - but the marks left by visitors over many centuries, dating well back into the medieval period. Among the graffiti is a Templar cross; a reminder that the Knights Templar once owned a manor in Duxford, and helped build the nearby chapel. Look for a large number of odd grooves in the stonework throughout the church. The grooves are thought to have been left by villagers sharpening their arrows. There are also a large number of very nicely carvings throughout the church, including human heads, odd beasts, and angels. The slender spire that tops the central tower is twisted awkwardly. This is said to have occurred when a heavy standard was installed atop the spire to commemorate Queen Victoria's Jubilee in 1897, and the flagpole was caught in a gale so strong that it bent the spire. 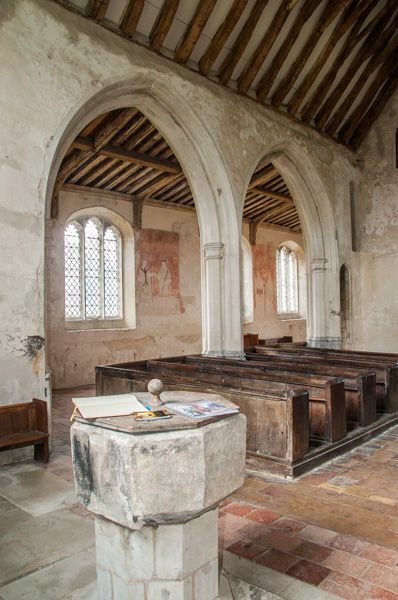 St John's church is now no longer used for regular worship and is cared for by the Churches Conservation Trust.